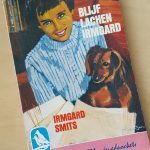 Ah, Irmgard….. Thanks to you I dreamt of staying in a sanatorium and hoped for a positive result every time I was tested for TBC at school. That I could also write without those circumstances only occurred to me later in life. Years of little poems and scrabbles, essays that were usually received very positively, stories for my children, blogs and diaries. It was simply the only way to translate the for me rather complicated outside world to my inside world and vice versa. And then finally a first book….and a second, and a third….I still think of myself as a translator, although the world calls me an ‘author’ now.